If you’re sick of all the kid-friendly and schmaltzy movies about a young boy and his pet dog/horse/alien/dinosaur/whatever, then boy is Lean On Pete the right kind of mature antidote to all of that. In this case, the pet is a horse, but don’t go thinking this is a whimsical Black Beauty-type tale of equestrian beauty, because writer-director Andrew Haigh’s adaptation of Willy Vlautin’s novel is far more grounded, more mature, and much more adult-orientated than anything that might come to your mind when it comes to horse movies. For one, the horse isn’t even the main character; it is, in fact, 15-year-old Charley (Charlie Plummer, last seen in Ridley Scott’s All The Money In The World), who lives in an impoverished area of Oregon with his womanising but still supportive low-income father (Travis Fimmel). By chance, Charley obtains a job helping horse owner Del (Steve Buscemi) with tending to the animals and preparing them for races, in the process forming a special bond with one particular horse who the film is named after. Without giving much away, one thing leads to another, and Charley soon sets out across the country toward Wyoming, with only the horse for company. I know you’re probably going into this movie thinking it is just another one of those “boy-and-his-pet” movies, but do yourself a favour and get that thought out of your mind, because the horse barely even factors into it half the time. It is much more about this young boy finding his place in the world, and gaining company who he can talk to about his problems without being judged or neglected, but so far his best option is with a being that cannot even talk. As the movie slowly makes its way towards the mid-way point – and I do mean slowly; this is very much a slow-burn – things occur that really enforce this kid’s desire for somewhere to call home, and with people he can both trust and talk to, all the while retaining a sense of understanding about why he makes the decisions that he later makes; you totally buy here why he refuses to let his horse friend be sold off for slaughter when he begins to underperform in races, and then run off with it deep into the desert. The places he ends up going, and the situations he is inadvertently placed in, vary from being either calming or downright terrifying, and the strength in both the script and direction by Haigh is that it never feels manipulative or overly melodramatic, and instead comes off as frighteningly realistic and harsh as it needs to be, all the while keeping the focus entirely on this young boy’s struggle to fit in to an uninviting new world. Haigh has really lucked out with the casting of young Charlie Plummer as his lead, because the young lad is such a magnetic and captivating presence in this film, easily carrying this movie on his tiny shoulders, and manages to be absolutely fantastic in every single second he is on screen. Through his soft and wide-eyed performance, you really feel this kid’s burning desire for companionship and a place to call home, and when things get rough he doesn’t take it lying down, in one instance committing an act of brutality that seriously make you want to cheer, especially when you know who it’s directed to and why, but also leaves you in shock because you wouldn’t think that this kid had this much anger in him, especially after going through the things that he does in this film. All the while, Plummer remains utterly captivating in an empathetic and incredibly strong performance, with even his chemistry with the titular horse being perfectly believable. The film is also made up of character actors who weave in and out of the narrative, from Steve Buscemi to Chloë Sevigny to Steve Zahn, who all contribute to the overall story in their own significantly different ways, as characters who could have easily gone into stereotypical territory but don’t because the actors playing them are strong enough to give them their own unique sense of characterisation. This being the kind of film that it is, a sort-of road trip movie across the harsh and unforgiving American landscapes, you can expect quite a lot of pretty visuals to compliment the much darker story that this film provides. It is a beautifully shot movie, with cinematographer Magnus Nordenhof Jønck really spoiled for choice since he’s got such a giant canvas to work off of, but he manages to make it look handsome and alluring in every single shot, even in the darkest of nights and brightest of days. The way that it is, the cinematography makes the film look and feel like a mini-epic, enough so to disguise that this does not even come close to having the budget of other epics do, but in regards to how it is shot you’d be forgiven for thinking this cost a lot more to make than it probably did. It cements how Haigh is a new master in slow-burn cinematic storytelling and captivating character drama, which if you’ve seen his previous films like Weekend and 45 Years you’ll already have had a bit of a taste of what he can do, and with Lean on Pete he has probably made his most ambitious and certainly his grandest – in terms of scope, at the very least – film to date, which unselfishly also allows room for its young lead to truly shine as well. It’s definitely a movie to check out if you’re a horse lover, but do not go in expecting the kind of movie you think it’s probably going to be. 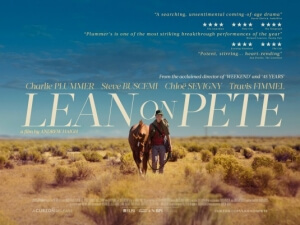 Lean on Pete is a grand and beautifully shot mini-epic that writer-director Andrew Haigh manages to make empathetic without leaning towards melodrama, and gives us a fantastic lead performance from young Charlie Plummer as well.